The owner of the restaurant apologized and told Facebook users in the replies that the person responsible for the message was fired. A New Jersey Restaurant owner apologizes for an insulting and "disrespectful" note written by an employee, who was in turn fired. An employee at a New Jersey restaurant was fired for leaving a message on a receipt that insulted a police officer who was eating there, according to the owner. 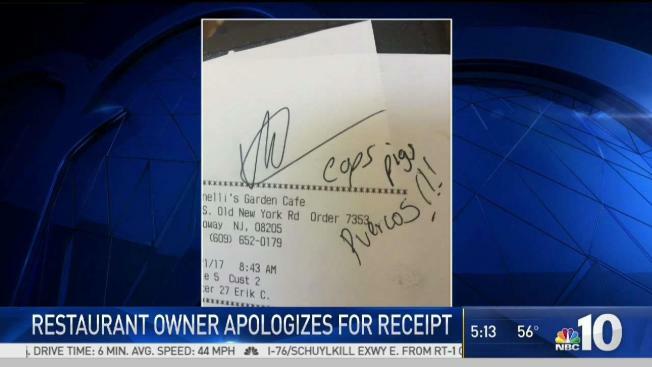 A photo was posted on social media showing the words “cops,” “pigs,” and “puercos” on a receipt at Romanelli’s Garden Café in Galloway, New Jersey. “Puerco” means "pig" in Spanish. The owner of Romanelli’s posted a message on Facebook addressing the receipt. He confirmed that an employee wrote the message and gave it to a police officer. The owner apologized and said his business supports police. He also told Facebook users in the replies that the employee responsible for the message was fired.